Powered by over 100 years of piano craftsmanship and 45 years of synthesizer innovation, the CP88 stage piano boasts authentic acoustic and electric piano sound, realistic piano touch and an intuitive one-to-one user interface. The CP88 is for the discerning pianist needing fast, accurate touch response. The triple sensor, natural wood keys provide grand piano weight and response while synthetic ebony and ivory keytops provide tactile grip during extended playing sessions. CP88 features three premium concert grand pianos: the Yamaha CFX, Yamaha S700 and the Bösendorfer Imperial 290. These pianos provide full dynamic expression and nuance through meticulous recording and voicing. [ U1 ] The UI is the most popular upright piano in the world. The CP88 U1 Voice features a vintage, well-used character. This makes it perfect for any music needing the vibe and sound of an authentic upright piano. 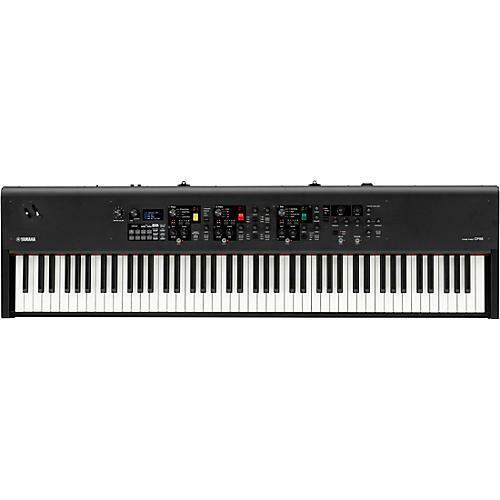 [ Yamaha CP80 ] Yamaha introduced the CP80 and CP70 electric grand pianos in 1978 to give musicians great grand piano sound that could cut through a live band. The CP80 sound on the CP88 is powerful and fat with wide, dynamic range. [ Wr ] The Wr reed electric piano Voice offers vintage and modern versions with wide dynamic range.Organs, Clavi and Keyboards: CP88 also features a wide range of other keyboard sounds including: tonewheel, transistor and pipe organs plus clavi, FM pianos and more to cover any playing situation. CP88 connects and integrates into your home studio or live rig with onboard USB MIDI and audio connectivity.